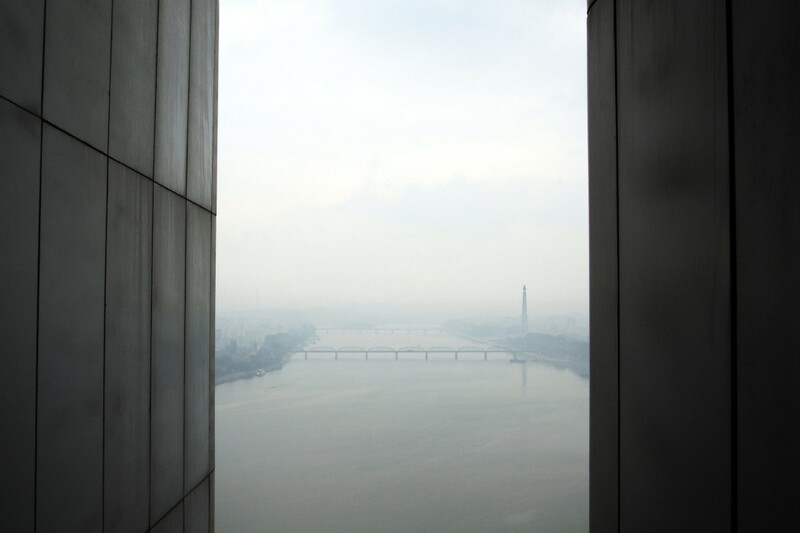 A view over the Taedong River in central Pyongyang, viewed from the Yanggakdo Hotel. 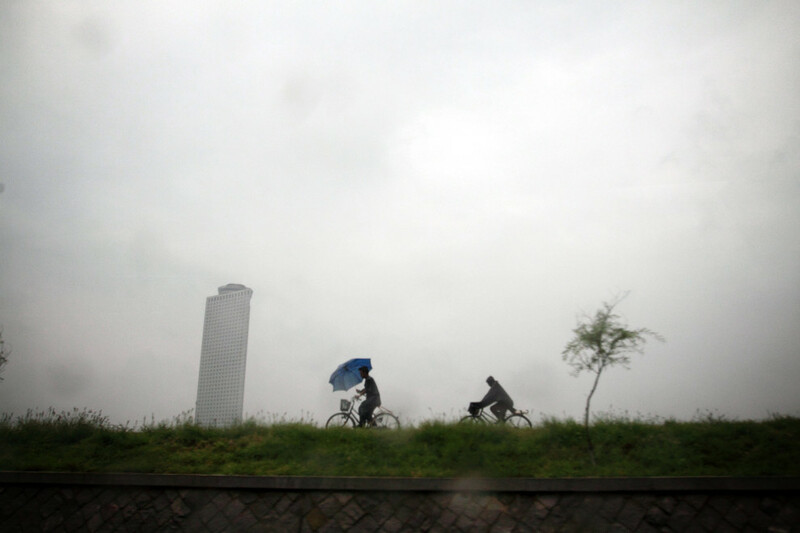 North Koreans cycle during a rainshower near the Yanggakdo Hotel, in central Pyongyang. North Koreans queue to enter the 'International Friendship Exhibition' in a city near Pyongyang. 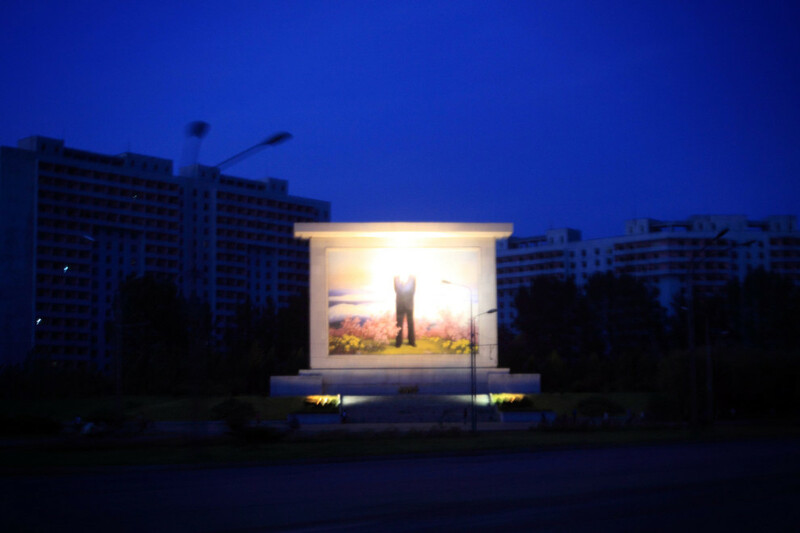 A North Korean tour guide stands near a temple, in a small town near Pyongyang. 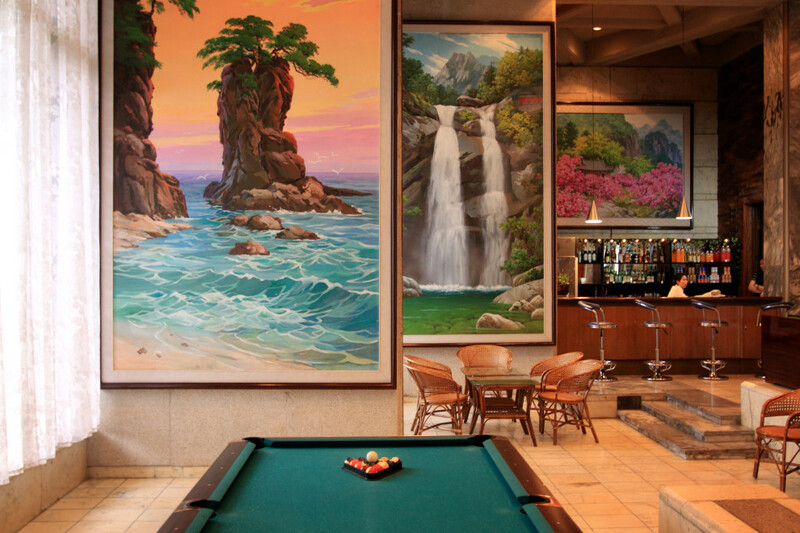 The lounge area of an elaborate hotel in North Korea. 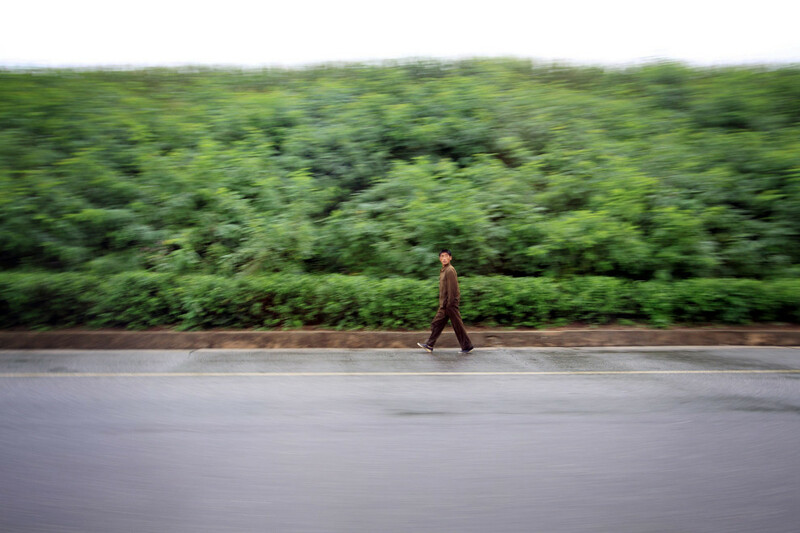 A North Korean man walks along a deserted highway near to the capital, Pyongyang. 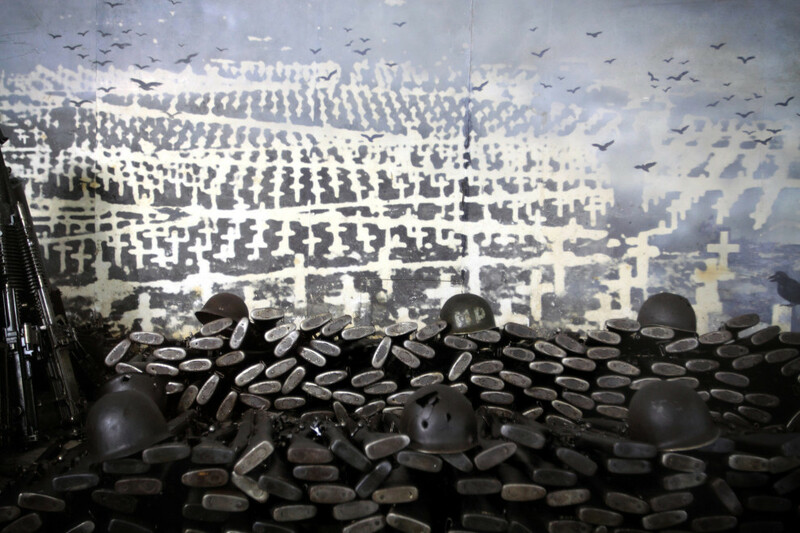 American guns and munitions sit in the Korean War Museum in central Pyongyang. 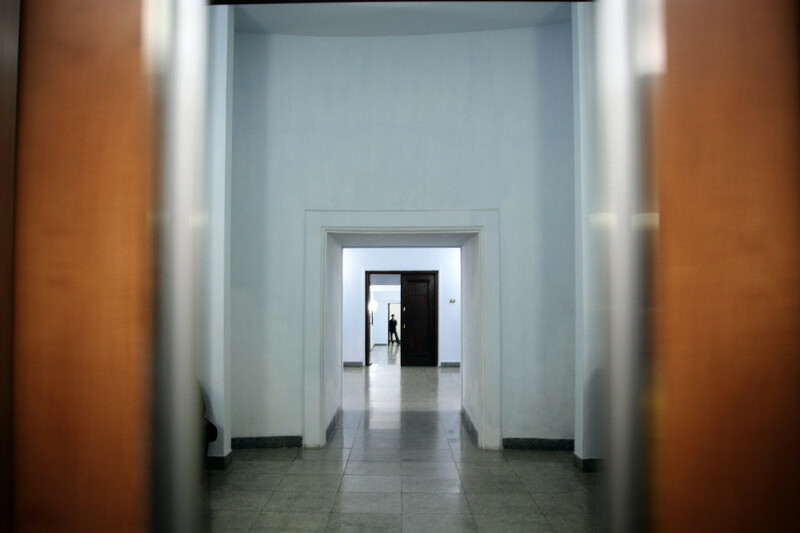 A man stands in the corridors underneath the Juche Tower, in central Pyongyang. 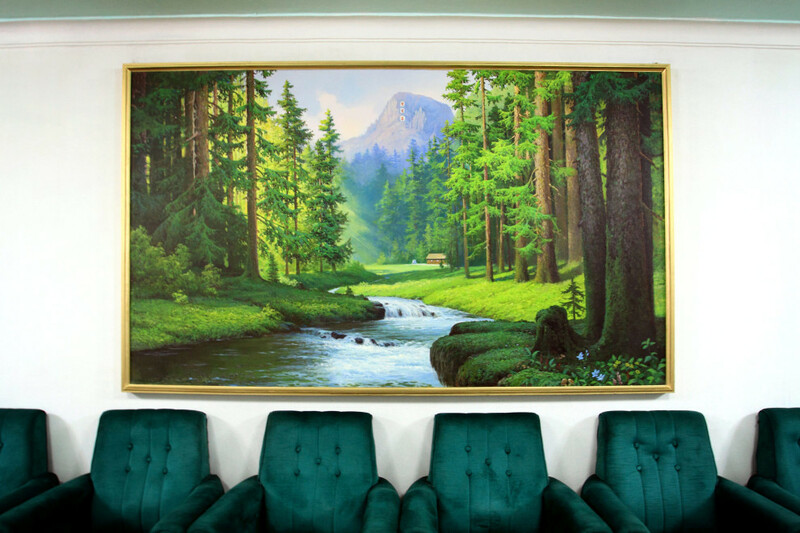 An elaborate painting in the corridors underneath the Juche Tower, in central Pyongyang. 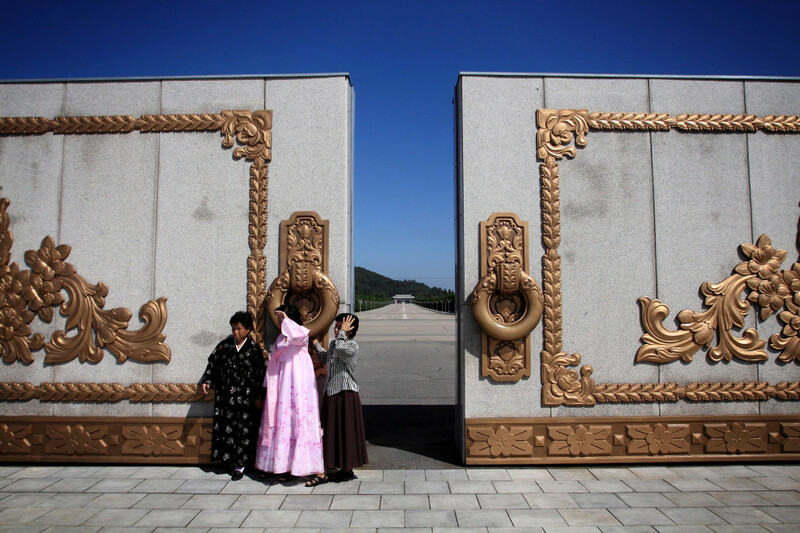 North Koreans stand near an elaborate gate in the grounds of the Kumusan Memorial Palace which houses the embalmed bodies of Kim il-Sung and Kim Jong-il. 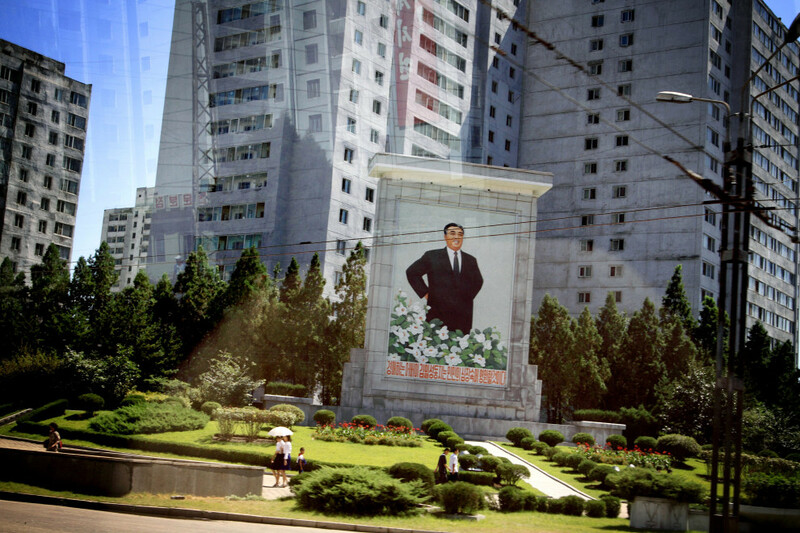 A painting of former North Korean leader Kim il-Sung, in downtown Pyongyang. 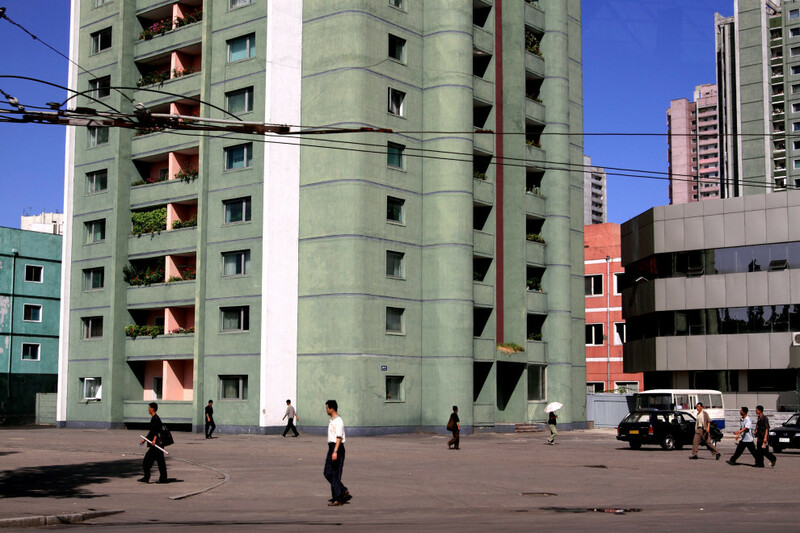 North Koreans walk past an apartment building in central Pyongyang. 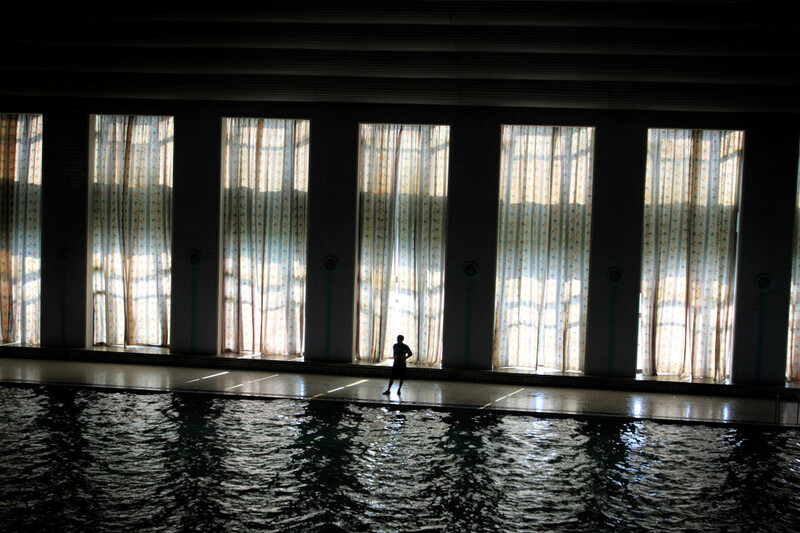 A man stands next to a swimming pool in the Mangyongdae Children's Palace, an opulent after-school center for the children of North Korea's elite in Pyongyang. 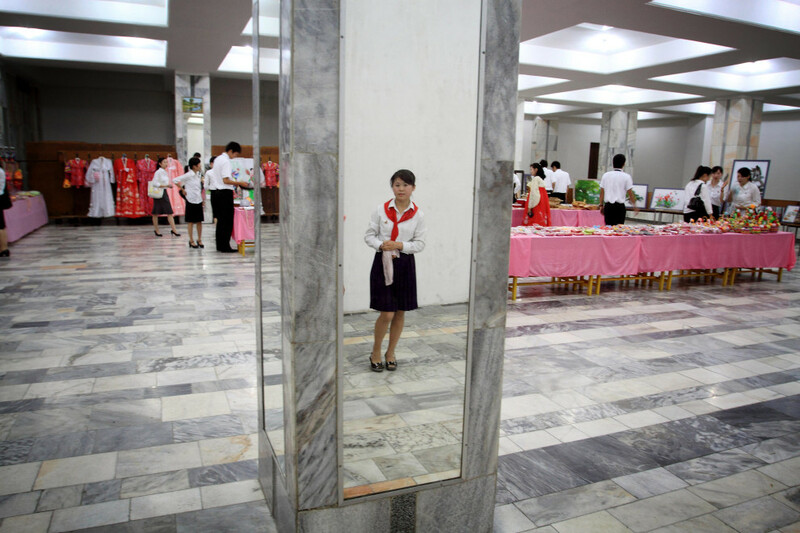 A young girl stands in the hallways of the Mangyongdae Children's Palace, an opulent after-school center for the children of North Korea's elite in Pyongyang. 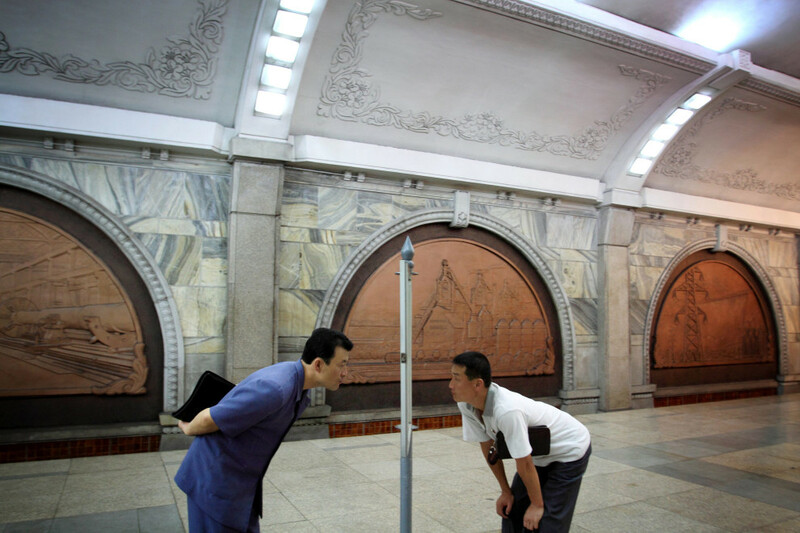 North Korean men read a timetable in a subway station in Pyongyang. 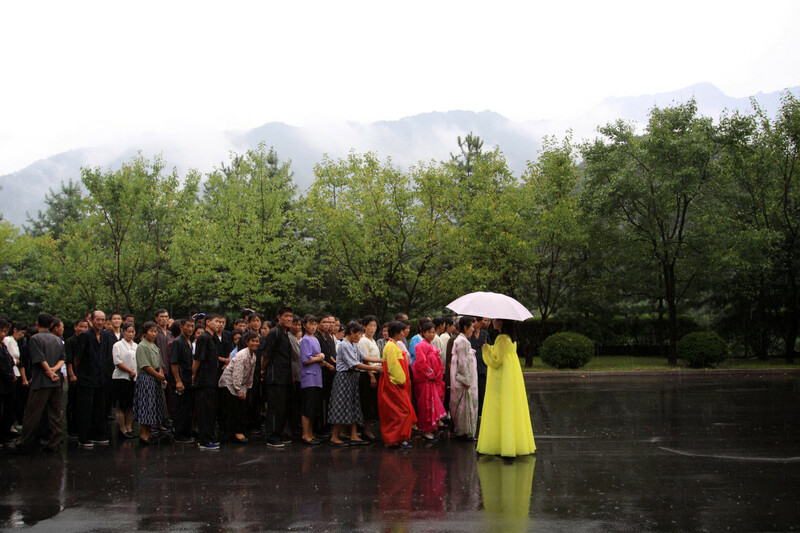 A bride and groom stand in a parking lot, in a small town near Pyongyang. 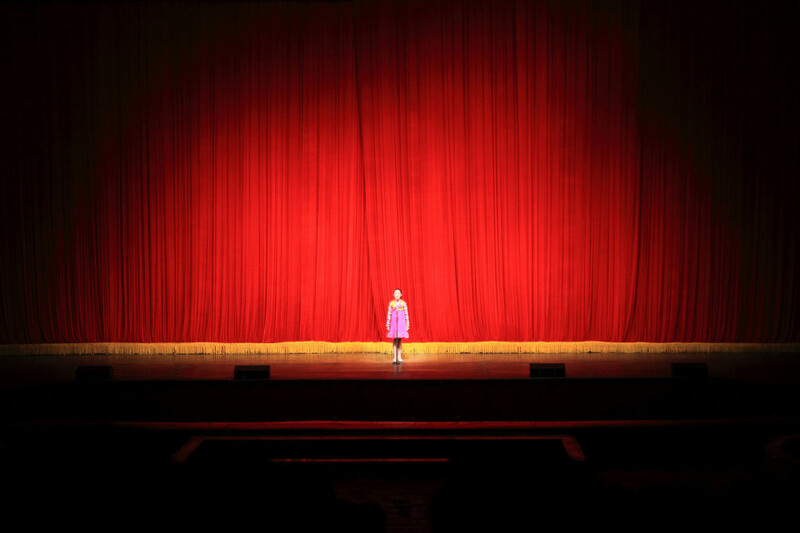 A North Korean girl stands on stage in the Mangyongdae Children's Palace, an opulent after-school center for the children of North Korea's elite in Pyongyang. In 2009, I was approached by the Canadian national newspaper, The Globe & Mail, to travel undercover into North Korea. The brief was to travel with their East Asia correspondent, Mark MacKinnon, and report on what we found during a 5-day tour of the most secretive country on earth. It was one of the riskiest assignments I have taken but ultimately we were able to get a rare glimpse into this secret nation and undertake a journey that very few are able to make. I was nervous because both Mark and I were posing as tourists, entering a country that was not exactly friendly to the foreign press. Immediately after the well publicized rescue by former U.S. President Bill Clinton of journalists Euna Lee and Laura Ling, who had been caught illegally entering the country, this was maybe not the best time to be trying to sneak into North Korea. With Mark’s passport indicating his journalist credentials hidden (replaced by one with no such indications) and my camera broken up into as many parts as possible and spread around my person, we actually didn’t raise too many eyebrows as we quietly slipped onto a bus packed with Chinese tourists.